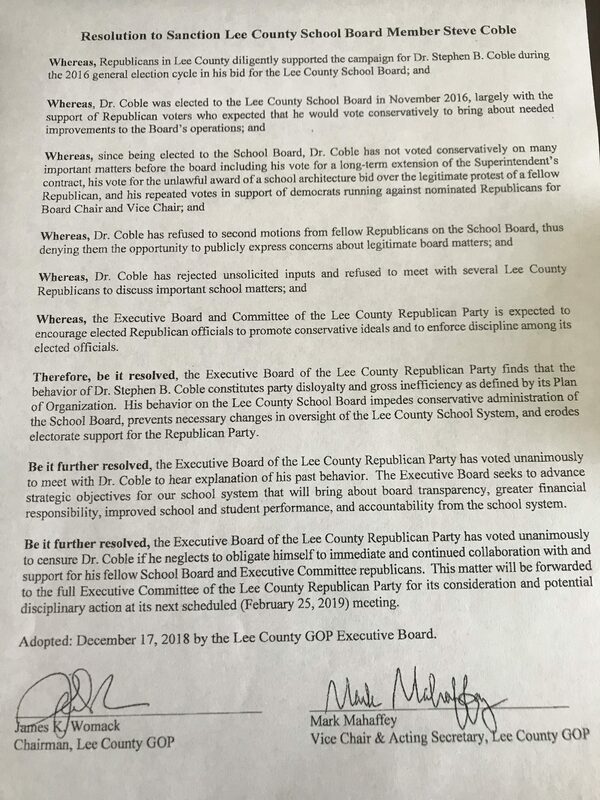 Lee County Board of Education member Stephen Coble has been censured and possibly reprimanded by the local Republican Party for voting against the wishes of party leadership, according to documents obtained by the Rant. 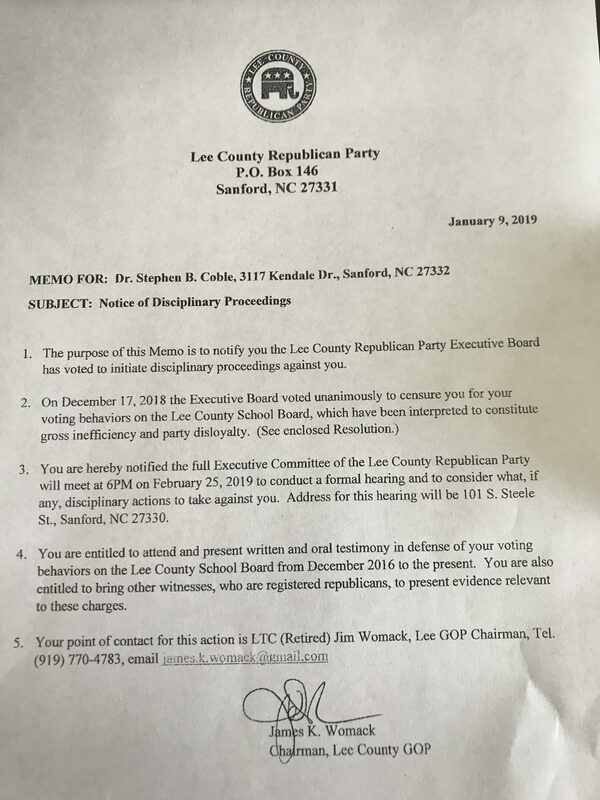 Lee GOP Chairman Jim Womack on Jan. 9 sent Coble a letter notifying him that the party’s executive board had “voted to initiate disciplinary proceedings” against Coble. Coble, a former headmaster at private Lee Christian School in Sanford, was elected to the Board of Education in 2016 along with Democrats Patrick Kelly and Dr. Lynn Smith, and Republican Sherry-Lynn Womack, the wife of the GOP chair. He finished third in an eight person field (the top four won office) with 11,497 votes – about 1,000 more than the number of registered Republicans in Lee County at the time – out of roughly 22,000 cast. Those numbers indicate that Coble almost certainly received a healthy amount of bipartisan support that year. Womack, a controversial–to–put–it–politely former Lee County Commissioner who also chairs the state’s Oil and Gas Commission, was elected chairman of the Lee GOP in 2017 and immediately embarked on a failed bid for the top leadership post of the state party. 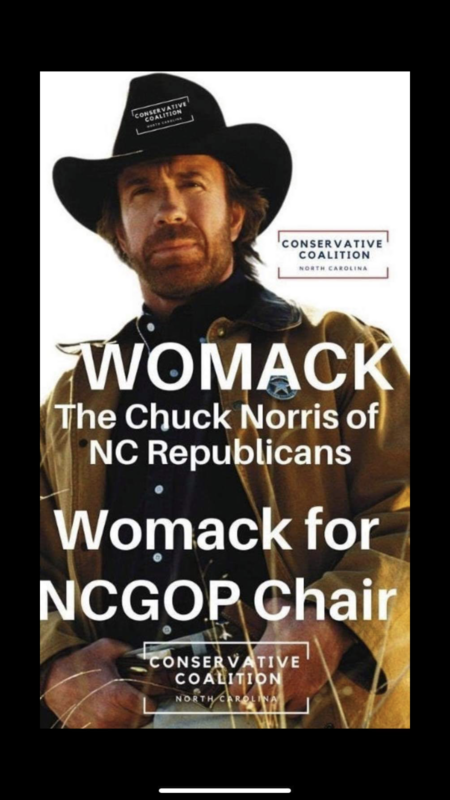 He is currently running again for chairmanship of the N.C. GOP (on what appears to be a martial arts expert/action hero platform). Womack’s resolution indicates that one of the functions of the county GOP’s executive board is “to enforce discipline among its elected officials,” giving a potential glimpse at how he would deal with bipartisanship as the state GOP’s chair – which became a distinct possibility a federal indictment was announced of his one-time opponent Robin Hayes. In any case, it’s more than fair to describe the conflict as a logical outgrowth of the decision in 2013 by friend of the Rant Mike Stone – a decision that’s been staunchly defended by Womack – to make school board elections partisan affairs. Supporters of that move have said it would give voters a better idea of where candidates stood on various issues. But in practice, it’s effectively made a public servant for whom roughly half the electorate cast votes answerable instead to a party boss selected by a handful of activists. That’s too bad. So they want to ‘punish’ a school board member for making an objective, informed decision, just because it didn’t go along “party lines”???? G.M.A.F.B. I don’t think you understand what a charge of party disloyalty is. It’s an official condemnation. Among many things, Dr. Coble conspired with Democrats to elect a Democrat as chair after Republicans won the board, he has joined them on several issues in a manner not fitting with the beliefs of the Republican Party, and this is just an official way of telling him that Lee County Republicans, the people that worked on the campaign to elect him, are not happy about it. So tow the party line, don’t think for yourself, don’t be an individual. Only the collective matters and we’ll threaten your re-election if you don’t bow down to the GOP demands. Gotcha. You seem reasonable Mr.Womack… er.. I mean… “HarktheSound”. Funny, you and the Womacks are the only ones who seem to think this way. It’s almost like you are forming an opinion rather than being factual. If Coble “violated” the Constitution, sue him, censor him. You won’t though. All you’ll do is continue this public smear campaign on an honest man until you find someone that worships the Lee County GOP’s lord and savior Jim Womack. This is why school board elections should be non-partisan. What a shocker. No room for thinkers in today’s political landscape. In fact, the local GOP sound like communists! You know, cross the party and off to the gulag. But they are afraid of democratic socialism! (god forbid). What BS. These people are idiots, what else is there to say. Party first is about as red as it gets. Red, what a coincidence. For god’s sake Jim, he was even a christian school headmaster! You act like all Dr. Coble did was take a different stand on an issue. That’s not it. He stood for election as a conservative, backed by the Republican Party, and if he wants that support maintained, he must continue to represent the values that the Republican Party does. He is free to try to run for re-election without the GOP, but he might himself hard-pressed for campaign workers. Maybe he just voted his conscience. Apparently, that’s something you can’t do anymore, if you’re an elected Republican. Fire the superintendent? Partisan issue. Don’t second a motion made by a Republican? Disloyalty. Over 11,000 people voted for Dr. Coble, and how many voted for Womack? 60? 50? Fewer? Dr. Coble is accountable to the voters, not thuggish party bullies like Womack. So, here I am, an infamous Democrat, standing up for a Republican. Just as I have no fear that the local party will waste its time censuring me for this, so Democratic elected officials should feel free to vote their conscience without ridiculous protest from the party. Let the voters decider! Fascist GOP! He happened to be a Republican, but his loyalty is to the students of Lee County, not the “party”! Dr Coble is one of the fairest people I know. It is great to know that an actual politician is doing what is right for the people instead of what is right for the party. The party was not elected, Dr Coble was. This is nothing more than a party thinkingvtgey can dictate policy. That is what is wrong with this country now. It is true, Dr. Coble was elected, not the GOP. But you must remember, Dr. Coble would have had a hard time getting elected without GOP campaign support, and he’ll have a hard time getting re-elected without it. That’s a consideration to be had. GOP campaign support? What is that, even? If you run as a Republican in this county, you won’t know whether the volunteers (or even the leadership) are telling voters at the polls not to vote for you (this problem is worse when you’re running alongside the party chair’s wife). Or maybe, they’ll just “one shot” some other Republican on your ballot, leaving you out in the cold. Sure, they’ll put out your signs; they might even buy them. But, signs are almost meaningless when it comes to persuading people to vote for you, so when they go door-knocking, you’d better hope they’re including you. Finally, if you do manage to get elected, you’ll have to deal with the incessant input of Jim Womack, who will feel as if your election was really his, vicariously. This will come in the form in “unsolicited input” (a synonymous phrase for “spam”). So, Dr. Coble was censured by a group of less than .05% of his electorate, for ignoring spam and voting differently than Jim Womack wanted. I wonder what happened at that “hearing” from which Dr. Coble wisely abstained. I wonder if they ruled against him in absentia, only to discover they had literally no power to do anything to him. Thankfully Dr. Coble has enough sense and integrity to do what is right for the schools, not what what Mr. Womack “dictates”. Jim Womack is an embarrassment to the Republican party! Take a seat Jim and learn from Dr. Coble! It is not the “dictates,” as you put it, of Mr. Womack that are in question here. It is his refusal to listen to the Republicans that helped elect him, not only in casting votes for him, but in campaigning for him. Your comment shows a complete lack of knowledge of facts. View Coble’s unethical violation of our NC Constitution Article 1 Section 16 in the video on Lee County Schools website http://www.lee.k12.nc.us under BOARD MEETINGS for January 2019. It takes about an hour to watch & you will witness Board member Sherry Womack inform the Board of its violation just before Coble,Kelly, Smith, & McCracken band together knowingly cast their votes. Mr. Jim Womack has more integrity in his little finger than S. Coble. This isn’t about what Dr. Coble did when he was headmaster, this is about holding Dr. Coble accountable for the actions that he takes when elected with an “R” next to his name and with the support of Republican activists. It’s exactly about what Dr. Coble did as principal of 2 Christian schools for decades: following his conscience. Maybe he voted for a Democratic chair because all the other Republican candidates were substandard, in his view, and he didn’t want the job, himself. The “R” next to his name doesn’t mean he has to vote however Jim Womack wants. Maybe he didn’t second Sherry’s ridiculous motions because they were ridiculous (is he the only other Republican on that board? Were the others similarly censured?). Maybe he doesn’t see firing Dr. Bryan as a political issue, because it isn’t one. Maybe he thought Lee County’s horrible superintendent turnover rate is a problem. Oh, and maybe that “illegal” contract award wasn’t so illegal, in his view. After all, “illegal” in this context isn’t a fact but an opinion. Whatever Coble used to do must be very different from the unethical & unconstitutional acts Coble has made concerning the BOE & kids/teachers/community over the past year or more at least. View for yourself as Coble knowingly (along with Kelly, Smith, & McCracken) violate our NC Constitution Article 1 Section 16 in reference to money violations by the superintendent. This video is available for anyone to view at the schools website http://www.lee.k12.nc.us under BOARD MEETINGS for January 2019. It takes about an hour to watch in its entirety. I don’t know how much of this article is fact or opinion. But based on the choice of language there seems to be a political slant to the RANT. Please do what’s best for the students. Sir, you may view the actual facts for yourself by viewing videos of school board meetings at the schools website http://www.lee.k12.nc.us under BOARD MEETINGS. If you view the video for January 2019 you will witness Coble violate the North Carolina constitution article 1 section 16 along with Kelly, Smith, and McCracken. This violation is one of many since Coble has been on the Board of Education for Lee County. Dr. Coble is a school principal. Having his knuckles rapped is surely a familiar event. The oft repeated vow by most voters,“I vote for the party, not the man” has never been more validated than here. So help me God. I expect a school board member NOT to vote along political lines, but instead, vote for the benefit of the students! Lisa – You made your opinion known 6 times, I think that’s more than enough! Just live with the face that other commenters disagree with your assessment. Dr. Coble, runs an Independent, I will support you! If you belong to a party, your opinion doesn’t matter….. You are a pawn of a political gang…. expected to do as you’re told…. follow their agenda…. We the people???? Or is it, We the party??? Our vote or opinion doesn’t matter….the parties make sure of it!!! !